Crispin Blunt has said he will table a motion expressing no confidence in the Speaker when the House of Commons returns from recess on Tuesday. In a statement posted on Twitter, the Reigate MP accuses Mr Bercow of bias over Brexit and overruling precedent on "a number of key votes". The Speaker's office did not provide a comment on the motion. Mr Blunt acknowledged there was "much to admire" about Mr Bercow's near ten-year tenure but "enough was enough" as many MPs had "an unshakeable conviction in his bias on the Brexit issue". Has race to succeed John Bercow begun? "Even his most partisan supporters for the positive changes he has delivered as Speaker do not now seriously dispute his bias in the conduct of our affairs," he said. "If colleagues are too cowed or too content with the direction of his bias to state their view on Speaker Bercow's obvious partiality then not only will he feel able to continue... but also exercising the power of his office wholly inappropriately. "The essential attribute of his office is now missing. It should not be allowed to continue, not least without anything being formally said." Image caption Mr Blunt said the Speaker had displayed "obvious partiality"
Mr Blunt has said he intends to write to MPs seeking their support for an Early Day Motion (EDM) expressing no confidence in the Speaker. The EDM is expected to be tabled on Tuesday when the House of Commons returns from recess - however there is no guarantee that such a motion would be debated. The Speaker, who was elected in 2009, has come in for growing criticism in recent months from pro-Brexit MPs. In January, they accused him of ignoring the advice of his officials about parliamentary procedure over Brexit. Commons leader Andrea Leadsom said his actions were "extremely concerning" but Mr Bercow said he was "not setting himself up against the government but championing the rights of the House of Commons". 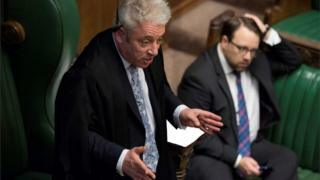 Following the heated row there were reports the government would block Mr Bercow from getting a peerage - normally accorded to Speakers when they retire. Mr Blunt's move is not the first time MPs have attempted to oust the Speaker. In 2017 Conservative James Duddridge tabled a motion of no confidence, but it was only signed by four other MPs. And two years earlier, he survived a bid by David Cameron's government he survived a bid by David Cameron's government to change the rules on electing Commons speakers - a move seen by Labour as an attempt to remove Mr Bercow.